Meet Scarlet - she is a 7 year old bi blue girl that is very sweet and well mannered. Unfortunately, she has tested heartworm positive. She has started on the 4 month long treatment protocol and is doing well so far. She also has some urinary issues with dripping/leaking that we are working on. We have done an urinalysis, a culture from a sterile sample, and have tried 2 different medications on her with no luck. We have an appointment with an internal medicine specialist in 2 weeks. Meet Molli. She is 9 year old larger Sheltie. Sadly, her owner had a severe stroke and was unable to care for her; she had her from when she was a puppy. We just did bloodwork and a dental cleaning on her on Friday (2-15). We started her on Glucosamine, too. She was already spayed and UTD on vaccinations. She is super friendly, happy, and loves people! She likes to go on walks and play fetch with a tennis ball. She would do best as an only dog or with a submissive one. She is being fostered in Little Rock, AR. For more information, contact us at info@mysheltie.com. Meet miss Jingle Belle. You can tell from her name that she came into rescue right before Christmas! She is a cute little 12 pound female who came from a commercial breeding situation. She is a little shy which is to be expected but is doing well in adjusting to life in the real world. She needs time, love, and patience to help her bloom into a confident family pet. She is 1 1/2 years old and has a pretty bad under bite (but it's so cute!). She is crate trained and is doing extremely well on house training. She needs a home with a securely fenced yard AND a playful young dog to be her playmate and mentor (no exceptions on both requirements!). She is being fostered in the central Arkansas area north of Little Rock. Adopter must be willing to drive to meet her. For more information, contact us at info@mysheltie.com. Layla – her foster mom and dad are adopting this little one! Layla is a 3 year old small sable female. She came from Arkansas where she had some pretty severe medical issues that are now all resolved! She is working on socialization and learning to trust humans, and will need a very secure fenced yard. She is being fostered in north GA.
Roxy – 13 year old sable female whose owner died suddenly which brought her into rescue. She is cute, loves everyone, and is fully up to date with vetting. She recently had blood work done and a dental cleaning. She is seeking a loving home to live out her senior years. Roxy is being fostered in the north Georgia area. Faith – a 2 year old small sable female that came from a commercial breeding facility. She is still very shy but making slow progress. While she is shy, she will sometimes take treats from your hand if they are super yummy. Faith is small, less than 15 pounds! She gets along well with other dogs and has recently tried to play with her foster dogs and toys. She will continue to work on socialization with her foster family. If you have experience with shy dogs, please consider inquiring about Faith. Adopting a shy dog and watching them blossom is such a rewarding experience! 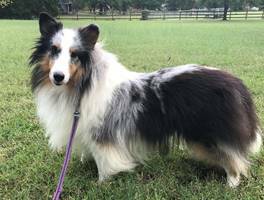 Halley – 4 year old blue merle female that came into rescue when her owner died. Halley tested light heartworm positive; we are hoping with Doxycycline and time, we won’t have to treat her with Immiticide. She is a pretty girl and gets along well with other dogs. Do you have a place in your heart for this sweet girl?